I'm not the sort of girl who can just go on doing the same old same old thing over and over and over again. No. I'm not. I ran into a Tunisian Crochet pin on Pinterest the other day that intrigued me-- I've seen this sort of stitching before, but didn't know how it was done. Was it Knit? Was it Crochet? Turns out, it's a little bit of both. 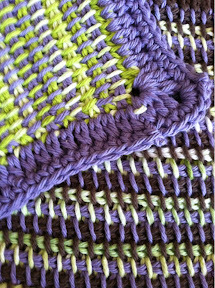 It's crochet in the sense that you use a hook, you pull up loops.... And it's knit because you leave pulled up loops on the hook, much as you work with yarn on a needle. Each row is made up of two "passes"-- on the first pass, you pull up loops across, leaving them on the hook. The second pass involves yarning over and pulling through loops and dropping each stitch off the hook as you go. At the end of the row (the end of the second pass), all loops but one are off the hook. I learned everything I needed to know over at StitchDiva. Their tutorials are perfect, and the 3-color Tunisian method has crazy potential. In fact, when my mother called me and requested some new cotton dishcloths (she loves the nubby crochet goodness), I knew this was the way to go. 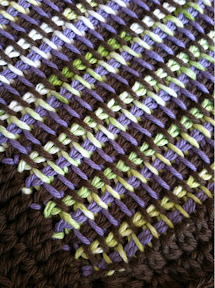 This is the simplest Tunisian stitch (Tunisian is also called "Afghan Stitch", if it looks familiar to you). The vertical bars you see are the loops that you pull through on the first pass. It's very easy to see where you are inserting your hook, and the 3-color method is even easier, as each step has a single color thread to work with. So--- on one pass, you are working only with color A, on the second pass, you are yarning over with color B. 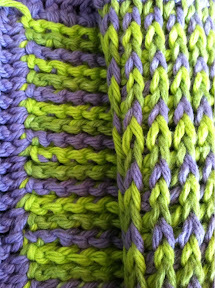 Beginning row 2, you introduce color C, and just leave all the colors waiting for you at the end of the row. No joining at the end of each row... the colors are right where you left them. It's like magic, I tell you. This is the front of a 3-color piece that I made this morning. 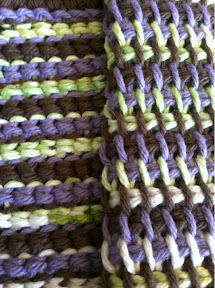 I like to use two solid colored yarns (here shown in lilac and brown) and one variegated yarn (here, a green/white mix). And the BACK is what makes it perfect for my mother's nubby dishcloth needs. Very nubby. Almost scrubby, even. Looks quite similar to the reverse side of a knit piece, actually. And speaking of knit.... This cloth was made using a stitch that mimics a traditional knit stitch so closely, I'm not sure I'd be able to tell the difference. But I didn't use knitting needles. I used a crochet hook. There ARE special hooks for Tunisian crochet.... They are much longer than a traditional crochet hook, and have a stopper at the end, much like a knitting needle.... But I didn't use them for these samples. I found that it was easy enough to keep up to 30 stitches on my traditional crochet hook without even trying. Won't need to special order an Afghan hook, or even head out to my local yarn store until I decide to make something larger. Although, knowing me, it won't be too long until I do just that. 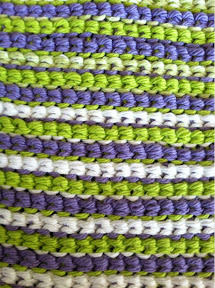 Front and back of the Simple Tunisian Stitch. 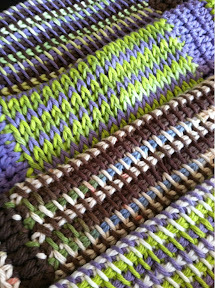 It's worth noting that you want to use LARGE hooks with Tunisian crochet, otherwise, it's just too tight. It seems too loose as you are working the first pass, but with the second, you are adding two more strands,so it works out. For these samples, the recommended hook size for the cotton yarn was a US size H/8 (5mm). 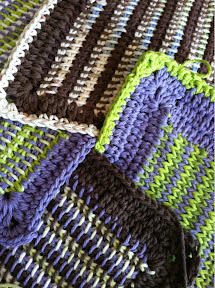 I ended us using a US J/10 (6.00.mm) for the Tunisian stitches, and switched to the H for the traditional crochet borders. Now. If I can just convince someone to weave in all those ends for me, I'll be set. What have YOU learned or taught yourself lately? Hmmm?